For the most part this press trip has been a wrap-up research trip for my next book, “Resting Easy in the US; Unique Lodging Options for Wheelers and Slow Walkers”. The title pretty much describes the theme – I’m hoping to encourage folks to “think outside the box” as far as access goes, as present a wide range of accessible properties across the US. Which brings me to the Berkshires to see a cool little project of the Appalachian Mountain Club – Noble View. Located just five miles from Russell, MA, it’s a world away from the hustle and bustle of city life. Basically they renovated a few historic cabins (circa 1900s) and added a new accessible bathouse, to make it a rustic yet doable destination for everybody. The cabins include several bedrooms, and are meant as group accommodations, however I guess you could book a single room if you don’t mind mixing with another group. There are accessible bedrooms in both cabins downstairs, and they include a bed with a mattress (you bring your own bedding/sleeping bags). The cabins also have a large commercial kitchen, a nice public area and a large deck. There are also picnic tables around the cabins, and it’s just a great outdoor space. The bathhouse includes a large family bathroom and shower room with a roll-in shower. It’s very nicely done access-wise. And they are adding tent platforms and developing an accessible trail. The view from the cabin is very bucolic. I was just so relaxed there. I just love finding these cool little accessible projects, as it shows people that there really is a world of accessible choices out there!! Kudos to the Appalachian Mountain Club for making Noble View an accessible reality! 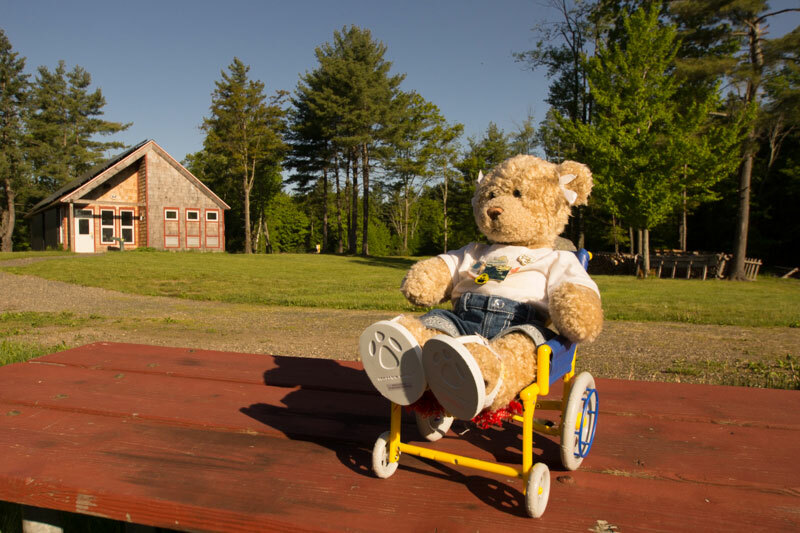 This entry was posted in Destinations, Lodging, Traveling Cherrie and tagged accessible travel, affordable, barrier-free, Berkshire, cabin, disabled travel, MA, Noble View, reunion, wheelchair by Candy B. Harrington. Bookmark the permalink.